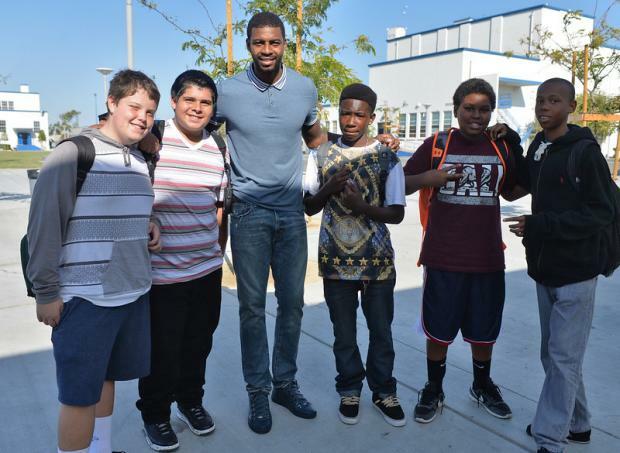 Jillian Marshall jumped on a chair in Leuzinger High School’s courtyard to see over a crowd of other students surrounding Portland Trail Blazers player Dorell Wright, an alumnus who served as Principal for a Day on Friday. His presence electrified the Lawndale campus. “Let me get a picture of his smile real quick,” Marshall said, holding a cellphone up to the 28-year-old Portland Trail Blazers player. Another student, Victoria Fakava, momentarily stopped swooning to discuss Wright’s visit. Principal Michael Ono kept charge behind-the-scenes while the basketball star read announcements and visited classrooms throughout the day. “Good morning Leu House, I am honored to return to my roots as Principal for a Day,” Wright said. “Just a reminder: Please be on time. Time is money. You can’t get any money if you’re late. You cannot learn what you need if you are not here. As a student, Wright said he was never sent to the principal’s office for being in trouble because he was focused on playing basketball and advancing his career. Freshman Jimmy Bas chatted briefly with Wright, and said he’s looking forward to telling his brother — a fan — about the conversation.